Many participants in this class are preparing for competition. *A crate is strongly recommended for this class. 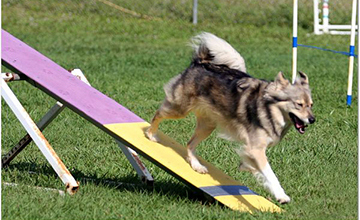 This class is designed to advance you and your dog’s agility skills and to prepare you and your dog for competition if desired. The class will build on jumping skills, obstacle discrimination, and distance handling skills. The dogs must be reliable off leash and under good control. Dog/handler teamwork is emphasized, not on just getting through a sequence but the way in which it is accomplished. The class is designed to teach the handler and the dog how to gain confidence, accuracy, and speed. Performance on all equipment will be fine-tuned. We will continue to work on more complex sequences and run advanced courses. You will be building on skills learned in earlier classes with a further emphasis on handling techniques and course strategy. You will also begin to learn advanced international-style handling skills and maneuvers to increase your skill and effectiveness and build on obstacle discrimination.